Looking for expert loft conversion ideas and advice that will give you a well-designed, cleverly thought-out extra bedroom, bathroom and even living space? 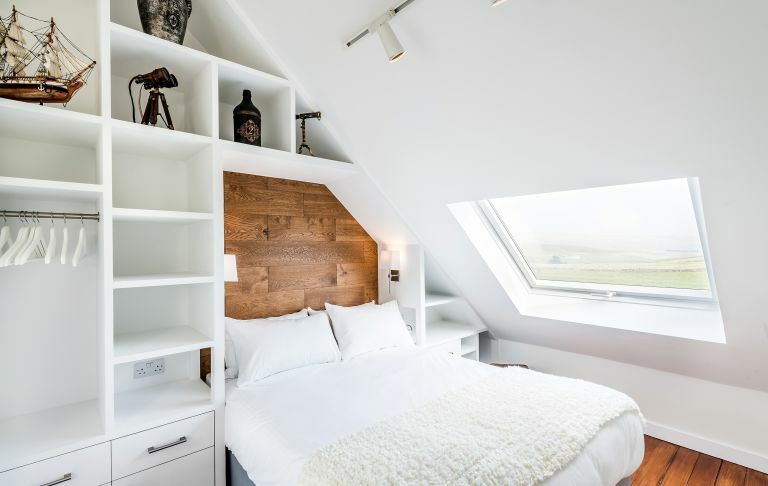 Before you begin any work on your loft conversion's interior design, it's vital to get not just the structure right, but also your budget, the room's configuration, the position of windows, and of course your loft's energy efficiency. Read our expert loft conversion design tips and advice to ensure you know everything you need to so that when you come to planning your loft conversion, it runs smoothly and comes in on (or under) budget. Lofts with a minimum head height of 2.3m are usually seen as fit to convert, although obstacles like chimneys or water tanks, as well as the pitch of the roof, can also affect this decision. If the roof space is less than 2.3m, don’t throw away your dreams of a conversion, as there are other options available. Removing sections of the roof, or all of it, makes it possible to gain the required headspace, however, this adds to the cost and requires planning permission, unlike a more simple conversion. Alternatively, it is possible to lower the ceiling of the rooms below – again, this is more costly. You could also opt for a modular conversion – built off site and installed afterwards. If your loft conversion is on the smaller side, or you're opting for a couple of small rooms as opposed to one large one, take advantage of the naturally cosy feel offered by small spaces. While opting for a light coloured scheme – you really can't beat white – has the power to make a room feel larger and lighter, it needs to be balanced out to prevent it from feeling too clinical. Pair with warm woods and the occasional soft furnishing in a deeper shade to ensure the room feels cosy and welcoming – this is especially important if you intend to use the space as a spare room. Use these cosy bedroom decorating ideas for more inspiration. You need to consider the layout of your completed loft conversion long before you start work. This means deciding where you will position pieces of furniture, the bathroom and any built-in storage. If you are planning an en suite, take into account the ceiling height in the space and prioritise pieces – namely the shower and hand basin – that cannot compromise on headroom. The location of the stairs should also be considered during the early stages. Consider all possible options in order to maximise the space offered within your loft conversion. Decisions such as placing the door at the top or the foot of the staircase can also mean the difference between a boxy loft conversion and one that is more open. 1. The first is to commission a designer, such as an architect or architectural technologist, to produce drawings, which can be put out to builders on a competitive tender basis. You will be able to steer the designer to create exactly what you want, but fees for what is a relatively small project may be high as a proportion of overall costs, and you’ll also need to hire a structural engineer. 2. The other option is to hand the whole project over to a design-and-build contractor, who will have a designer, engineer and builders in their team. They might be less creative in design terms, but the all-inclusive price is a benefit. Taking time to think about the size and position of your windows is an important aspect of a loft conversion design. As a general rule, glazing should make up 20 per cent of the roof area if you're keen to maximise natural light. The position of the windows will often be dictated by the shape of the roof; for example, a long, shallow room will benefit from windows spaced evenly along its length, whereas a narrow, deeper room will benefit from one large window. Use our guide to maximising daylight to get tons more tips for bringing light into your loft conversion . If you have all the living space you need downstairs but are lacking bedrooms and bathrooms, then a loft conversion can be the perfect way to bring your home into proportion. Most loft conversions are used for an extra bedroom or two with en suite bathroom. Other popular uses include a teenage den, cinema room or home office. If your home has amazing views, you could consider moving some of the living spaces up into the new loft too, to take advantage of them. Awkward dimensions and bulky beams don’t have to be a limiting factor in creating a bathroom in a loft space. While showers require a minimum amount of headroom and easy access, a freestanding bath can be sited under a low ceiling. Simple shapes and a traditional colour palette work well with period architecture. Check out our small bathroom design ideas for inspiration. A stylish shower or wet room is a great use of a loft, but you’ll need to check that you have enough headroom for a shower. In addition, if there isn’t a good-sized window, you’ll need to fit an extractor fan. Concealed shower fittings will help to make the most of the space, and a bespoke glass panel can be made if needed. Find out about choosing the right shower enclosure, screen or door for your space. If an extra bedroom in the loft isn't what your family needs, but you work from home, a home office might be the best option. In order to maximise productivity, a home office requires plenty of natural light, so steer clear of black-out blinds and heavy materials. Instead, opt for pale blinds in soothing neutral shades that still let the light in but will also reduce glare when they’re closed, allowing you to work efficiently even when the sun starts to drop – as essential for dazzling summer days as for shorter days in the winter months. If you're planning on transforming your loft conversion into a home office, you'll find our specialist guide to designing a home office a handy read. Lofts make great kids' bedrooms, playrooms or extra space for kids and teenagers, but it’s important to keep them cosy so they’ll get plenty of use. We'd advise keeping the scheme simple and injecting personality through the use of soft furnishings and other accessories, this way changes can be made easily (and inexpensively) as their interests change. Check out our guide to how to design a playroom for more tips and ideas. This bespoke dressing room (the stuff of dreams, right?) makes clever use of the space in the eaves with built in storage that combats the limitations of an awkward sloping roof. A large skylight floods the space with natural light, while floorboards are positioned to give the appearance of a longer space. We love the idea of tacking this walk-in wardrobe onto the side of a large master bedroom. Find out how to create a dressing room in our guide. If you don't have masses of space, but love the idea of incorporating a dressing room into your loft conversion, opting for an open wardrobe or clothes rack can dramatically reduce the amount of space required. If you like the idea of converting your loft (or at least part of it) into a Carrie Bradshaw inspired walk-in-wardrobe, take a look at our walk-in wardrobe and dressing room design ideas. If you're designing a bathroom to suit a loft conversion and are looking to tackle an awkward space, consider building handy recesses into the eaves. They make the most of space that might otherwise have been wasted and make a sleek addition to a contemporary bathroom – especially when designed to complement the rest of a scheme. They're also the best place for the toilet and bath to be sited. Check out our storage hub for lots of storage ideas and buys. Making the most of a loft conversion often means embracing the awkward spaces that can accompany them. If it's possible, insert shelves or a desk into a difficult corner, or have cupboards custom-built to suit a slanted roof, as this is a great way to maximising space and provides a handy storage solution. While white is the go-to option if you're looking to create the illusion of a larger and lighter space, a one-shade scheme may not be to everyones taste. Consider opting for a patterned wallpaper – preferably with a subtle repeat print – and in a complementary, light hue if you're keen to add a little more interest. This is particularly effective if you opt for a feature wall which, if positioned at the end of a room, draws the eye and creates the illusion of more length. See our feature wall design ideas for inspiration. When decorating a newly converted loft, window treatments will be high on your list of must-haves – mostly because the toplight you get through roof windows is so much brighter than the light that comes into a room via a window in a wall. Use our guide to buying blinds for roof windows to make the right choice, and bear in mind that made-to-fit are your best option. Consider using houseplants to make the space feel more lived-in and with a distinct sense of calm. Positioned beneath large skylights, they'll complement the natural light flooding in. For tips on which house plants are best suited to a loft, have a read of our guide to how to care for house plants. 2. Dormer loft conversions are the most popular option as they are the easiest way to add light and an increased amount of roof space with full headroom. The roof structure is altered at the sides or rear of the house to add a large, flat-roofed ‘box’ dormer. 3. Hip-to-gable loft conversions are most commonly found on the side of either end-terrace or semi-detached houses. The hipped (or sloping) side roof is removed and the end wall is then built up straight to form a new vertical gable. 4. Gable-to-gable loft conversions include a new box extension that spans the space between each gable end. It is worth noting that in some case you’ll need to increase the height of the gable end walls to act as ‘bookends’. 5. Mansard loft conversions create extra volume. The process involves the replacement of either one or both roof slopes with very steep sloping sides and a flat roof over the top. 6. Modular extension loft conversions are used where the existing loft space is unsuitable for conversion. Measurements are taken and the new rooms manufactured off site before being delivered as a module. The existing roof is then removed and the new module installed. Try Moduloft for more. As a loft conversion is a ‘material change of use’, building regulations must be met. These cover matters of safety, including the strength of the floor, minimum headroom above the staircase, fire escapes, thermal efficiency, electrics, plumbing and glazing. The preparation for building regulations can be completed by either the designer or loft conversion company you are working with. Adding a loft conversion provides the perfect opportunity to make your home more energy efficient, as the installation of specific insulation is a requirement of building regulations. There are two forms of insulation and a building control inspector – either an independent inspector or one from your local authority – will determine which type your home requires. Cold-roof insulation In total, 10cm of insulation is required; 7cm made up by filling the space between the rafters with foam insulation. The other 3cm of slab insulation is attached to the inside of the rafters. It’s essential that a 5cm gap be left between the roof felt and insulation to allow for ventilation. Warm-roof insulation involves foam insulation 10cm-thick fitted over the rafters before adding capping, tile battens and tiles. This is a more complex option commonly used when a roof covering has been stripped, perhaps when creating a dormer. A 10cm-thick slab of foam insulation can insulate a dormer wall, while a 10cm-thick quilt of insulation is required between plasterboard attached to either side of an internal partition wall. You’ll need 10cm-thick insulation between floor joists. If your loft conversion will include extended sections, consider whether you want the new exterior to contrast with or complement your existing property. You could choose matching brickwork, or include rendering or cladding for a more contemporary finish. For modern homes, frameless and minimalist-style windows are a great option. However, if you have a period property, there may be conservation requirements – such as requiring windows to sit flush with the roof – that reduce your options. 22. Accept that your loft conversion will cause some upheaval! If you’re having a basic roof light or dormer conversion, then there’s no reason why you can’t stay living in your house throughout the project. Most contractors will erect scaffolding and cover any sections of roof they’re removing with tarpaulin. They will also start with the external work, meaning the majority of your house won’t be affected until they knock through and install the staircase. If it’s a more major project, for instance where most of the roof is being replaced, then you may want to move out for a couple of weeks, particularly if the work is being done during winter. Most loft conversions will take between eight and 12 weeks to complete, while modular lofts can be installed in two weeks. Matching bannisters and tread design to those of the existing house can make the new staircase feel like it's always been there. Ideally, its proportions should echo those of the stairs below, too. Carpeted stairs in the rest of the house? Match it to cover your new stairs to create a seamless link. Same goes for the wall treatment – if you can match wall paint colours or wallpapers to the hallway below, your new space will be more successful.